Contains Wheat And Soy Derivitives. Organic Flax Seed Oil, Organic Evening Primrose Oil, Organic Olive Oil, Wheat Germ Oil (Expeller Pressed) And Vitamin E - As Mioxed Tocopherols (Natural Antioxidant For Freshness). Vegetarian Formula. Organic Flax Seed Oil, Organic Evening Primrose Oil, Organic Olive Oil, Wheat Germ Oil (expeller pressed) and a natural antioxidants blend of Organic Sunflower Oil, Organic Rosemary Extract, Natural Mixed Tocopherols (from soy), Ascorbic Acid and Citric Acid. Take 1 tablespoon 1 to 2 times daily, preferably with meals. Not manufactured with yeast, wheat, gluten, soy, milk, egg, fish, shellfish or tree nut ingredients. Processed in a GMP facility that processes other ingredients containing these allergens. Softgel capsule (gelatin, glycerin, water, carob). 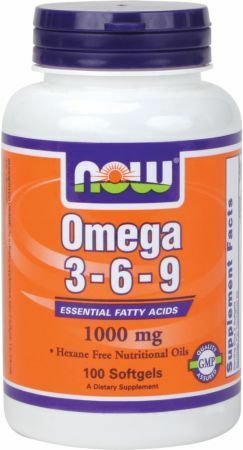 Each serving may also provide the following naturally occurring amounts of polyunsaturated fats and monounsaturated fats: Omega-3 [Alpha Linolenic Acid (ALA)] 45%; Omega-6 [Linoleic Acid and Gamma Linolenic Acid (GLA)] 26.5%; Omega-9 [Oleic Acid] 17.5%; Other (short chain fatty acids, saturated fats, phospholipids, etc) 11%. Consider taking NOW Omega 3-6-9 in combination with NOW CoQ10 and NOW Alpha Lipoic Acid.